ASIA/MYNAMAR - Letter from religious leaders to the people:"The future of the nation is in compassion and reconciliation"
Cardinal Bo: "No to the dam that deprives us of 'our mother', Irrawaddy"
Card. Bo: "The silence of Aung San Suu Kyi speaks of pain, responsibility, struggle for peace"
Letter from religious leaders to the people:"The future of the nation is in compassion and reconciliation"
Yangon (Agenzia Fides) - "The future of Myanmar is based on the rich history and tradition of multi-religious and multi-ethnic coexistence. At a deeper level, this promising future is assured by the values and virtues of compassion, shared well-being and justice present in the great religious traditions of Myanmar". 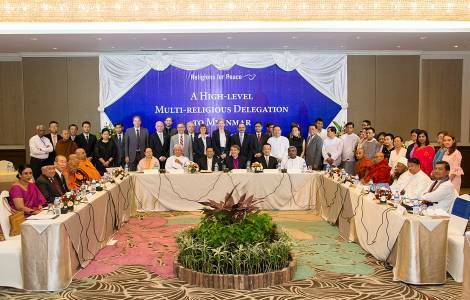 This is what religious leaders of Mynamar, gathered in the forum "Religions for Peace", led by Cardinal Charles Maung Bo, said in a special Letter to the population released today, May 24, and sent to Agenzia Fides. In the text we read: "As Buddhist, Christians, Hindus and Muslims leaders of Myanmar and of the whole region, we write to you in solidarity with the hope of peace. We are now united in a crucial moment in which the future of this nation is being determined. Through the untiring efforts of countless men and women, you have endeavored to overcome suffering and heal the wounds of the past. Myanmar has shown the world that a peaceful transition of power was possible". The Letter recalls that "during the great disaster of Nargis in 2008 Buddhist monks saved the people affected in all the villages; Christian humanitarian agencies distributed aid to those who suffered their ethnic and religious borders, and Hindus, Muslims and other groups joined together to help their fellow men and women" and states: "Compassion and common life are values and fundamental virtues of the people of Myanmar and unity in diversity is the strength of this nation". The religious leaders reiterate: "We refuse the improper use of religion and race to divide our people" and commit themselves to giving their contribution "to resolve inter-community conflicts and to advance national reconciliation", expressing "prayers for the peace at the Panglong Conference", which "will strengthen the transition from dictatorship to democracy, from conflict to peace". The leaders take note of "the growing hostility and large displacement of people in the Kachin and Shan states, which further weaken the peace and reconciliation process", committing themselves "to working with the government to reach a national agreement based on a federal democratic system in Myanmar". The Letter states: "We share a vision of development in Myanmar, which is based on the notion of human dignity, human rights and the common good. At the basis of sustainable peace is the respect and realization of human dignity, the undeniable and sacred essence rooted in our nature as human beings and peoples". The leaders urge to remember that "the profound spiritual heritage of Myanmar is expressed in the teachings of the great religions of the world practiced in this country", Buddhism, Christianity, Islam and Hinduism, religious traditions that teach "compassion and reconciliation", as Pope Francis reiterated in his visit to the country. Noting "the incitement to hatred on social media that violates the fundamental spiritual principles of tolerance and respect" and the great masses of refugees, leaders "implore the government of the Union to take the necessary actions to ensure peace and well-being of displaced and marginalized populations", citing the difficult situation of all the communities living in the state of Rakhine. ASIA/SINGAPORE - Archbishop Goh: "May religions be united in promoting spiritual values in a secularized society"
ASIA/SRI LANKA - Interreligious violence, the Director of the PMS: "After the civil war, people want peace and prosperity"